I am sure that there are people that can get home projects done in a matter of minutes. Isn't that what these blogs and home decor shows lead you to believe? The one home project I was looking forward to was decorating our upstairs hallwall with photos from our past travels. While not quite as bad as when we tried to line our wedding invitation envelopes, it's a close second and definitely in the same level of Dante's hell. Get inspired. I found mine and posted about it here. Pick the photos. This took an incredible amount of time but was fun for the both of us. Since it was on our past travels, we had to put in a serious amount of time deliberating on how many photos from India VS Turkey. Hours people, hours went into this step. Buy the frames. 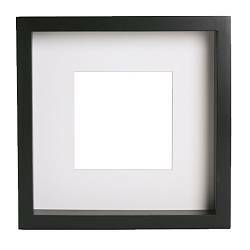 We went with classic black frames from IKEA. Match the photos to the frame. There were some photos that were meant to be displayed at the 4x6 size while others were deemed worthy of an 8x10. Another chunk of time spent deliberating. Contemplate what color to paint the hallway so that the photos would the focal point. Have the walls painted by our fabulous painter. Denton made cut-outs of the photos and hung on the wall for us to make sure that we like the arrangement. Ultimately, we decided to align the photos to an invisible line that was parallel to the windows. The arrangement took quite a bit of time and even some online research. Deliberate the arrangements and bite our nails at the prospect of marring our hallway walls. Bite the bullet and hang the photos. I'll post photos tomorrow of the finished hallway! Photo galleries take so much time but I'm sure it will definitely be worth the effort! Can't wait to see the final results!